One year before Maurice Sendak wrote Where the Wild Things Are, he contributed the illustrations to a remarkable book. Robert Graves was 67 years old, and had already written the popular novel I, Claudius (as well as a memoir of his experiences in World War I). But as both a poet and a scholar, Graves decided to write a children’s book about the magic of reading. 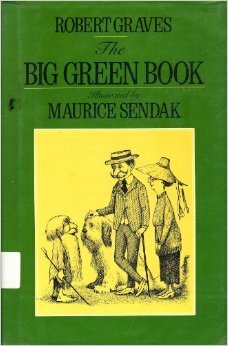 The Big Green Book describes a little boy named Jack, who discovers the very magical book in his uncle’s attic. The boy plays cards against his aunt and uncle – and he wins every time. Soon they owe Jack “about a hundred thousand dollars.” Sendak’s drawing captures the despair on the couple’s face perfectly. By the end they’re on their knees begging for a chance to win it back. And instead they lose their house to the boy – along with their enormous sheepdog. Before the book is over, the boy plays more pranks on his guardians that are sometimes even nastier. His uncle’s fingernails grow through his hand. (“‘Ow!’ said the uncle.”) Their sheepdog is chased away by a belligerent rabbit. But best of all, Jack surveys the house he now owns, from top to bottom – and then turns himself back into a little boy. And then he revisits his aunt and uncle to tease them about their losses.